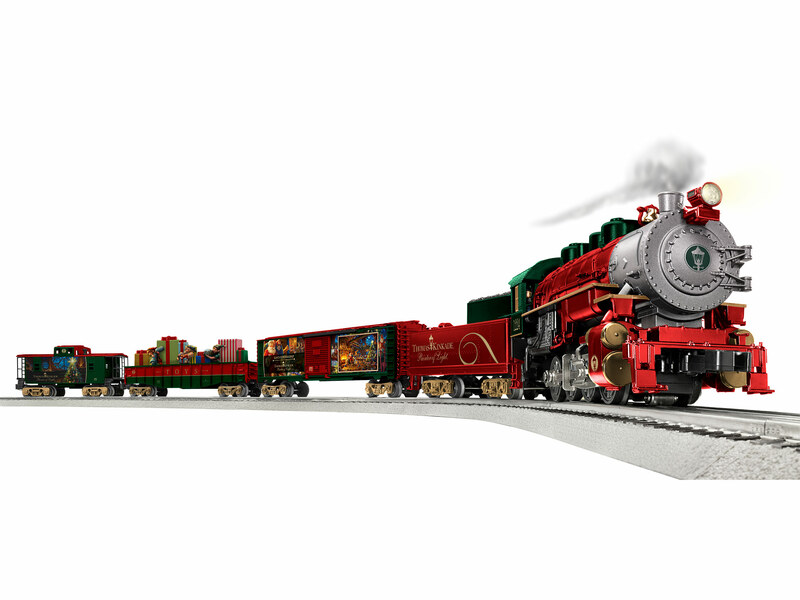 A CHANCE TO Win the Christmas LionChief Train Set featuring Santa’s Workshop artwork by Thomas Kinkade Studios.. Entry is simple! Just “Like” and/or “Comment” on the Train Set Giveaway Post (link to the post) on our Official Thomas Kinkade Facebook Page. Each “Like” and one “Comment” on the Facebook post qualifies you for an entry into this giveaway. 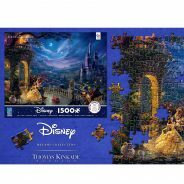 This contest runs from Wednesday, November 14, 2018 through Friday, November 16, 2018, and a random winner will be selected and announced on this webpage and on the Official Thomas Kinkade Facebook Page and on this webpage after they have contacted us to claim their prize. See below for complete contest details. 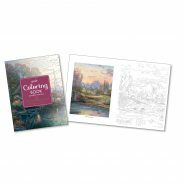 Additionally, you may enter to win this prize by “Liking” and/or “Commenting” on the Official Thomas Kinkade Instagram page. Each “Like” and one “Comment on the Instagram post qualifies you for an entry into this sweepstakes. Please note the Facebook and Instagram sweepstakes are two separate giveaways, and participants are permitted to enter both sweepstakes. Facebook Sweepstakes: Christmas LionChief Train Set featuring Santa’s Workshop artwork by Thomas Kinkade Studios..
Instagram Sweepstakes: Christmas LionChief Train Set featuring Santa’s Workshop artwork by Thomas Kinkade Studios. This contest is open to residents of the United States only. Entrants must be 18 or older to qualify and must use a valid Facebook account for entry. An individual may enter up to two times, 1) by “Liking” the Christmas LionChief Train Set Giveaway Post (link to the Facebook post) on our Official Thomas Kinkade Facebook Page, and/or 2) by “Commenting” on the aforementioned post. Only one “Comment” per person qualifies. Additional “Comments” do not constitute additional entries. This contest is open to residents of the United States only. Entrants must be 18 or older to qualify and must use a valid Instagram account for entry. An individual may enter up to two times, 1) by “Liking” the Christmas LionChief Train Set Giveaway Post (link to the instagram post) on our Official Thomas Kinkade Instagram Page, and/or 2) by “Commenting” on the aforementioned post. Only one “Comment” per person qualifies. Additional “Comments” do not constitute additional entries. This giveaway runs on Wednesday, November 14, 2018 through Friday, November 16, 2018. All eligible entries received during the Submission Period will be gathered using the Woobox Pick A Winner Tool. 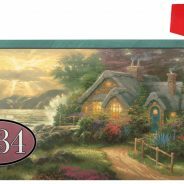 On Monday, November 19, 2018, the Thomas Kinkade Studios Social Media Team will use the Woobox Pick A Winner Tool to randomly choose two winners from eligible entries-1 winner for the Facebook sweepstakes and 1 winner for the Instagram sweepstakes. The winner will receive the allotted prize within 7 days of notification at the address specified by the winner at the time of prize notification. The winner is responsible for monitoring his or her account for notification and receipt of other communications related to this contest. 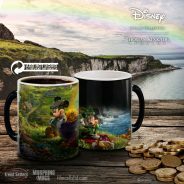 If a potential prize winner cannot be reach by the Thomas Kinkade Studios Social Media Team within five (5) days, that potential prize winner shall forfeit the prize. Terms and conditions may apply. Incidental expenses and all other costs and expenses which are not specifically listed as part of a prize in these Official Rules and which may be associated with the award, acceptance, receipt and use of all or any portion of the awarded prize are solely the responsibility of the respective prize winner. ALL FEDERAL, STATE and LOCAL TAXES ASSOCIATED WITH THE RECEIPT OR USE OF ANY PRIZE IS SOLELY THE RESPONSIBILITY OF THE WINNER. 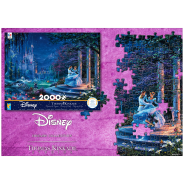 The Thomas Kinkade Studios is the sponsor of this giveaway. This promotion is in no way sponsored, endorsed, administered by, or associated with Facebook and Instagram, and entrants and participants agree to a complete release of Facebook and Instagram from any liability. All responsibility and sponsorship of this sweepstakes lies with The Thomas Kinkade Studios. Any questions about this giveaway should be directed to contact@thomaskinkade.com. My son has always been crazy about trains and he still is at 33. I would love to give him this for Christmas. i love Mr. Kinkades work. I have a couple of things. I know a family who would love this train set,their mom would be thrilled. 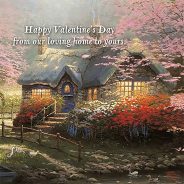 Always enjoy looking at my 5 Thomas Kinkade paintings and have received many compliments from friends. My parents bought me a Lionel train set on my first birthday, 62 years ago. 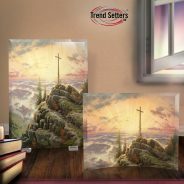 Thanks to Thomas Kinkade company for bringing us beautiful artwork. I grew up playing with a Thomas train set tell my dad past 45 yrs ago today the train never came out again.my mom got remarried and he sold it..would love to have one again. . I love all of Thomas Kinkade work. Wanted a train set since i was a little girl. I am 62 now. Trains are not just for boys. I love all of Thomas Kinkade’s work. Would so love to win this for my grandkids. love all my figurines from Kinkade,,would love to own this train set.. I have always loved Thomas Kinkade’s work. I own one print but I hope one day to turn that into one of his painted canvas, of course this will have to wait until the kids college is paid for. I was truly hart broken when he passed away. He was a truly an inspiration to us all. Love a train going around my Christmas tree. So nostalgic. I love everything Thomas Kinkade, but the train, my great grandson would love and maybe he would let his 72 year old grandma play with him and his train. Retired military who worked for a railroad company shortly after retiring. My three daughters (4, 10 and 13) loved seeing the trains upclose and enjoy them just as much now around the Christmas tree. My wife and I enjoy Thomas Kinkade; we have two of his prints. The thought and pleasure of having a Thomas Kinkade train going around our tree this year would bring it all together for the five of us. Such a beautiful set!! I always wanted a Lionel for my son and could never afford it. Now I have 2 great grandsons that would love this. I have several prints of Thoms sadly no original. Have loved his paintings and wanted to live in them ever since I discovered him. Felt like we lost a family member when he left us. Thank you and also to his brother who is keeping him going on the shopping channels. My home has several Kinkade prints and paints. A better artist, I have never seen. A Lionel train set for Christmas, would add to the enchantment of the season! Merry Christmas! I have always like Thomas Kinkade’s work and would love to win the train set for my great grandson who was just born 6 weeks ago. That way he would have something to remember me by as I will be dead before he is old enough to remember me. GOD BLESS YOU ALL THIS CHRISTMAS. I love Kinkade and trains.